So true…now a days we are so bound to our limitations. We don’t give chance to ourselves to explore new things. This happened exactly with me a few days ago. It was just a normal day. Kids had their afternoon nap and wanted to play something different. I tried books,toys and their favorite games too but both would play for 10 mins and again return to their cranky mood. So finally my elder daughter Antara had given a canvas and few crayons. In an instant 20 little fingers started showing their magic . Both were so excited seeing that white big canvas in front of them as we had never allowed them to touch any painting. 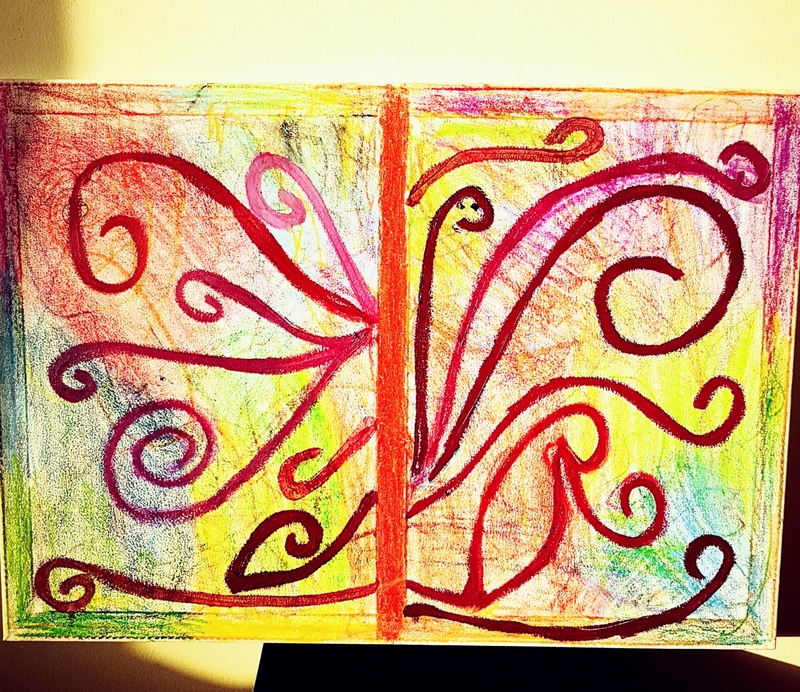 Both started scribbling all over the canvas. My little boy came & asked me more crayons as he already knew where I kept full box. Then little girl asked for more. 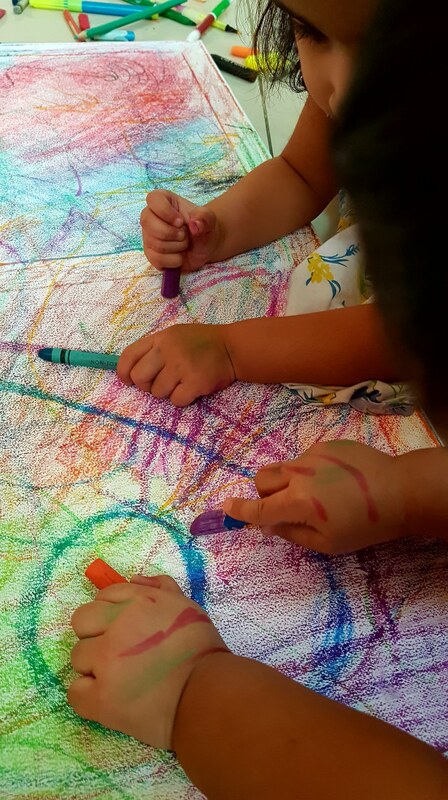 They started scribbling more with each and every color….both just didn’t want to miss that moment. They held crayons in both hands and filled every white space on that canvas. It took almost 2 hrs for them change to blank page to colorful page. It was a truly new & fulfilling experience. Finally Antara did some fine tuning and our first colourful canvas is ready and so as my blog…..I am sure you have such experiences too. Feel free to share your experiences! Also, please send your feedback on how I can make my blog more interesting! Children are so full of creativity. They just need a little encouragement. The picture is adorable just like your twins. Love the photograph where your daughter has got one leg up to make way for the crayons. The quote by Kim Nance is a good reminder. We often forget to enjoy the little things by sticking to rules and lines and sadly in our need to conform, we force the children to do the same from a young age. Thanks dear for feedback. Your comments always bring a smile on my face. So true, loads of expectation from kids would impact on their behaviour. Let kids be kids, let them enjoy themselves, even if that means bending the rules. So delighted that you liked my blog. Have a good day. 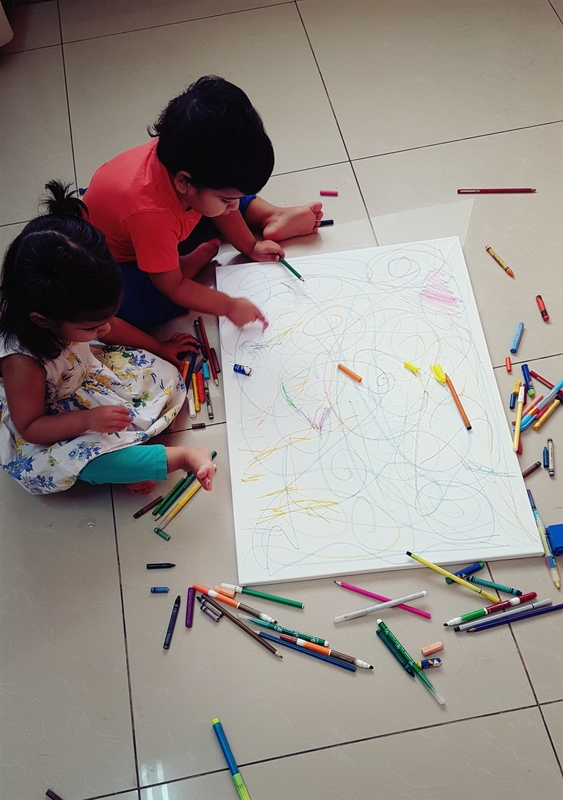 Love the way you’ve let your kids unleash the artist in them and colour away without setting any boundaries. aww so adorable, i miss those wonderful days when my kids were little ! The painting looks lovely!